Sometimes it’s nice to get out of town to get a fresh perspective on things. This week’s featured photograph from my Creative Sparks creativity workshop is by Jenna Lanam. The image was taken on her recent trip to St. Augustine, Florida. I am especially drawn to the simplicity of this image. The bold geometry and subtle textures provide a wonderful background for the single figure smoking on what appears to be a work break. 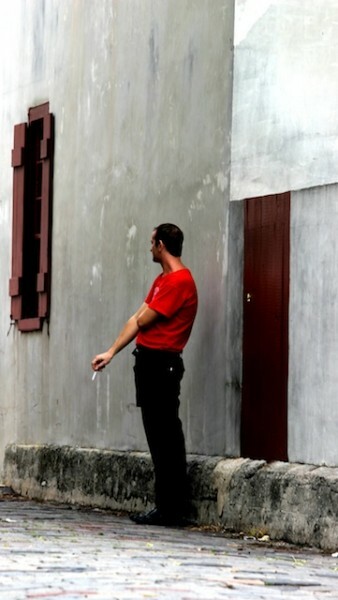 His bright red tee shirt creates a nice color contrast that really makes the image pop. I’m also fascinated by the complex space of the photo created by the different textures and light.